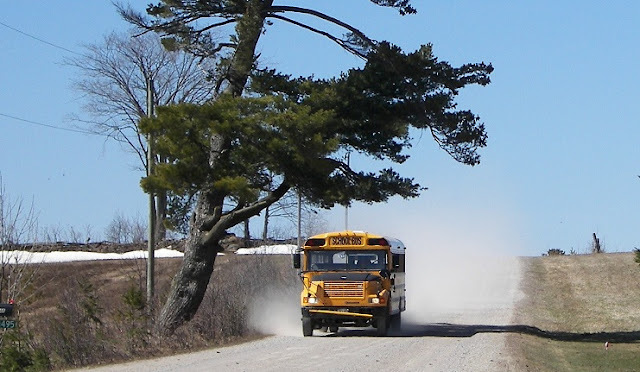 The rural school buses move the future hopes of communities and are much more civilized...at least that has been my experience. I never knew school buses other than field trips and high school football games. Love the image of the shadow brushing against and knocking things over. So creative and creative. I really do enjoy the rest of the poem as well, but that really hit me. Thank you for your kind words and in promoting the ancient poems on your site. as a passenger on a bus, a train or a car, it has always been a pleasure to see a wave and it never failed to result in a smile. i love the image of the shadows racing over the fields and knocking over fenceposts. you've told a vivid story with your verse. Thank you Leslie. I enjoyed perusing your words on your site as well. Brings back memories of my youth, we had "cacaphony" for sure, though we were passing small farms and woodlands in VT and not pastures where field hands counted their hours until the afternoon bus had passed. I wonder of the woman who waved, perhaps at the ghost of a child long gone. A story within a story. Very thoughtful/thought provoking piece. Perhaps, Ginny. Perhaps. Thank you for sharing your school bus memories of Vermont - it's God's Country. You could not have captured this scene more vividly. I felt like you were writing of where I live. I have to show this to a friend tomorrow. She drives a school bus, dirt roads, fields and all. Love this poem. Well done! Brings back fond memories of school bus rides. Who would've thought about writing a piece about a school bus? Excellently, perceptively written I must say. Thanks for sharing! This is an interesting piece. Thanks for posting it. I wonder what the farm worker was thinking. Maybe she wished she had furthered her own education. You pay close attention my friend. I really enjoyed this vision.